This past weekend at the Contemporary Cultural Center in Barcelona, Spain, an international and multi-lingual group of bloggers, artists, musicians, and lawyers met to discuss the Free Culture movement which aims to reform intellectual property law into a workable paradigm for the digital era. More than just another intellectual property geeks’ get-together, however, COPYFIGHT was also an important bridge conference between today's English and Spanish speaking copyright reform proponents on the internet. Unfortunately, many of the staunchest Free Culture proponents throughout Latin America were unable to attend the conference. Timing was especially inopportune as it coincided with the Weblogs.Comunicacion conference in Mexico City which also attracted many Free Culture heavyweights from the region such as ALT1040, Isopixel, and eCuaderno. Leading up to COPYFIGHT, the Spanish blog, Elastico, ran an excellent series introducing English speaking activists to a Spanish speaking audience. With that in mind, it seems like a worthwhile endeavor to travel through Latin America – virtually, of course – and take an abbreviated survey of the Free Culture movement and the voices behind it. Senator Fernando Flores was the first surprise. Flores was one of the youngest members of the Allende government. He was with Allende on Chile's September 11th (1973), when Pinochet executed his (American supported) coup. Flores has since had an extraordinary career — prison, exiled to America, time as a scholar studying philosophy and computer science, fantastically successful career in business, exploiting the insights he drew from academics, and now as a Senator (and one time candidate for President). what you want, but let me know, cite me, mention that I'm the author, play, change, inspire yourself, modify what you'd like, add things, take them away, but don't sell it and don't charge to show it to others. Oh, and you can share it, but with the same license. This is my license. There are others, they all include attribution, permit or don't permit derivative works, fees, etc. And this is the spirit of the Creative Commons licenses, recently inaugurated in Chile. And for everyone with blogs or that do poems, fiction, music, video, photos, or anything creative, should have one. On the Chilean technology weblog, FayerWayer, a long discussion/argument is still underway over the effectiveness and objective of Creative Commons licensing in Chile. Derechos Digitales and Atina Chile (from which you can download Lessig's presentation in Chile) and, of course, Creative Commons – Chile are also rich resources of information regarding copyright law and copyright reform in Chile. Moving on to Argentina, Jorge Gobbi gives a well articulated account of Lawrence Lessig and James Boyle's visit to the Buenos Aires Sheraton to speak on behalf of Creative Commons licensing which will officially be implemented in Argentina sometime in late September. 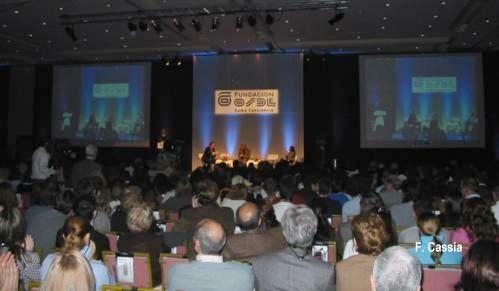 A lot of people – the organizers spoke of 1500 attendees – filled the biggest salon of the Hotel Sheraton Retiro in Buenos Aires. Frankly, I was really surprised by the large attendance. It remains auspicious that something so dry as a legal license has generated such interest. It must be recognized that the people of Creative Commons have done a great job to that respect; of showing that their project is, before anything else, a form of supporting innovation and the possibility to freely produce content without the legal threat of large corporations. The “Creative Commonists” seem to be taking the world by storm, and they certainly seem to have made an impact on the local audience, including myself. I will be eagerly awaiting their visit next September for the launch of the local CC license, which is getting worked on with the help of the OSDE foundation. It is Ariel Vercelli, however, who undoubtedly has the most informative collection of posts regarding copyright reform in Argentina, including this post entitled, A Revolution Not to be Ignored. You can download video footage of the Creative Commons event in Buenos Aires in both English and Spanish from Terra. The awareness of the Free Culture movement in Uruguay appears to be extremely limited. Rodolfo Pilas, however, is always a dependable source on the Free Software movement and Indymedia Uruguay does have a guide explaining Creative Commons licenses. When Ecuadorian blogger, Eduardo Ochoa, made a flash movie poking fun at the aggressive ad campaign of the telecommunications giant, Movistar, he was immediately sent a cease and desist letter from Movistar's lawyers. Upon reading the news, Mexican blogger and Free Culture enthusiast, Eduardo Arcos found the relevant text in Ecuador's IP law and advised Ochoa he was well within his rights. Ochoa's post has generated a large amount of commentary and legal advice, but he has yet to re-post his parody. Speaking of Eduardo Arcos, his blog, ALT1040 has become one of the major outlets of the Free Culture (Cultura Libre) movement in Latin America. He recently reported that the Mexican version of the RIAA – SOMEXFON – was planning an aggressive campaign of enforcing copyright royalties which included “the use of songs in establishments like restaurants, gymnasiums (including trainers who put on music), bars, hotels, commercial centers, hospitals, school dances, buses, urban transport, party halls, among others.” Arcos lists an example of prices which includes US $370 to listen to music at a party of more than 200 guests and US $1,650 a year to play music in a cafe. Then, pro-actively, he finds a Mexican senator in disagreement with SOMEXFON's fees and encourages his readers to write the senator encouraging reform. Creative Commons is currently working with Fulton & Fulton, S.C. to implement Creative Commons licensing in Mexico. You can read an English-translated version of the proposed license (PDF). Of course, it is Brazil who has been the Latin American poster child for Creative Commons and the Free Culture movement. 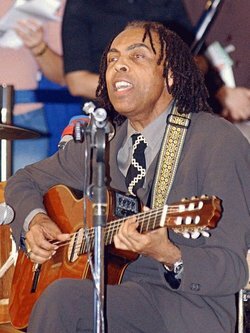 With the support of former musician and current minister of culture, Gilberto Gil, Brazil has become a mecca of freely shared creativity. You can learn more by downloading a short film about Creative Commons spreading to Brazil as well as staying tuned for these forthcoming documentaries on digital culture in Brazil. Wired Magazine also has an informed piece on Free Culture and Open Source Software in Brazil. In putting this together, I have tried to concentrate on the most important developments regarding Free Culture in Latin America. If, however, I have neglected any information or important links, please feel more than free to leave them below as a comment. Great review, but you missed the Land of the Incas! Well i let you know about the Project. We just began working before the CC Summit in June. The hosting institution for the Peruvian CC licences is CPSR-Peru (http://www.cpsr-peru.org). The Project Leads: Pedro Mendizabal (CPSR Peru President) and me (from CENTIC http://www.centic.org). We are both lawyers specialized in copyright and cyberlaw. The team is formed also by Katitza Rodriguez, lawyer too and Director of CPSR Peru) and Arturo Matos, engineer and consultant on IT and software development. We are just in the implementation process of the licences and plan to launch them in December. Plans are to also translate the licences in Quechua and Aymara both native languages of ancient Peruvian culture so we can reach the global Peruvian community. Thank you so much Oscar. I had no idea that Peru was so far along in its pursuit of implementing CC licences. Keep up the good work and I’ll make sure to stay up to date. Certainly it’s not a complete state of the Free Culture in our continent, but it’s a great to have feedback about all our work in our countries. Thanks a lot, and spread! I think it’s great that you write about the development of free culture in Latin America. In Colombia we’re also working in developing CC Colombia. Jaime Daniel Rojas, Carolina Botero and myself are coordinating the project, with the help of two universities, Universidad del Rosario and Escuela de Administración de Negocios EAN. So far we’ve contacted many representative institutions to talk to them about the project, we’ve created a discussion list, and we are preparing the first official draft of the licenses. We are planning to launch in December or January. If you want, I’ll keep you up to date. Thank you Andrés. Please do keep us up to date and all the best on the project. Hi David: Great article!! Many thanks for spread the world about free culture and copyright reform being happening this part of the world. CC-Perú is just starting and we hope soon has a wonderfull webpage where to share news and latest developments with all the community!!!. As you problably know, the US is exporting the DMCA through the FTA. In this moment, Peru, Colombia, Ecuador, and Bolivia as observer are negotiating this treaty with the S. They are incorporating all the “DRM”:http://www.cpsr-peru.org/lpi/mpt/ provisions incorporated in the DMCA, the Safe harbours provision for ISP liabilities and many other issues. You will find more info. about it here: http://www.cpsr-peru.org/lpi/tlc/ We are working with EFF advicing policy makers and NGOs (librarians, educators, ISPs, archieves, etc) in relation to the impact of the FTA to our society in the copyright field. We were also following the “Casting Treaty”, Here you will find the last info. about the recently Latinoamerican consultation in relation to this WIPO treaty. Thanks so much for the update and useful links. I hope this post continues to attract those involved in the Free Culture movement from around Latin America and that you all come back to keep us updated.